Known primarily as a composer and musician, Julius Eastman wrote in a press release for a 1981 performance at The Kitchen: "Now music is only one of my attributes. I could be a Dancer, Choreographer, Painter, or any other kind of artist if I so wished." Indeed, Eastman's practice varied widely and includes significant and abiding work with dance throughout his career. This little known history of Eastman's work in the dance field will be presented in this evening through discussion, screening, and performance. 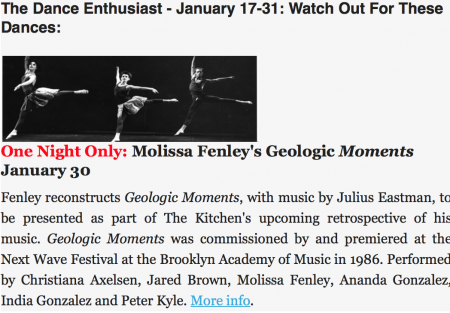 Molissa Fenley returns to The Kitchen to perform her work Geologic Moments, which she developed with a new score commissioned from Eastman as part of Brooklyn Academy of Music's Next Wave Festival in 1986. Accompanied by a remastered recording of the performance by Eastman and Joyce Solomon, this dance for six (including Fenley) begins in a slow tempo and dynamically accelerates, concluding in a solo for Eastman's baritone titled “One God.” Together, they explored the rhythmic interplay that epitomized Eastman's collaborative work in dance. Anna Kisselgoff described the work in the New York Times writing “this viewer was reminded of Kandinsky, of the idea that apparent abstraction contains a metaphysical point of view.” Dancers in this work include: Christiana Axelsen, Jared Brown, Molissa Fenley, Ananda González, India González, and Peter Kyle. Lighting design after Gary Mintz by David Moodey. A screening of archival footage of Andy de Groat's 1981 piece GRAVY, a medicine of spaces in rehearsal at The Kitchen with music by Eastman will be shown publicly for the first time. It will be contextualized by other archival material detailing Eastman's own work as a choreographer, with an emphasis on early works from his time in Buffalo, New York including his large-scale dance work Moon's Silent Modulation (1970). “That Which is Fundamental” is made possible with the generous support of Robert D. Bielecki Foundation, James E. Robison Foundation, Paula Cooper, Rebecca & Martin Eisenberg, and Agnes Gund; endowment support from Mary Flagler Cary Charitable Trust; annual grants from The Amphion Foundation, Inc., The Aaron Copland Fund for Music, Inc., Howard Gilman Foundation, and The Fan Fox and Leslie R. Samuels Foundation; and in part by public funds from New York City Department of Cultural Affairs in partnership with the City Council and New York State Council on the Arts with the support of Governor Andrew Cuomo and the New York State Legislature. Original support for “That Which is Fundamental” was provided by The Pew Center for Arts & Heritage, Philadelphia. Photo: Sandi Fellman of Geologic Moments, 1986.